Jaimie Henderson, M.D. is director of the Stanford program in Stereotactic and Functional Neurosurgery, and co-director (with Prof. Krishna Shenoy, PhD) of the Stanford Neural Prosthetics Translational Laboratory (NPTL). 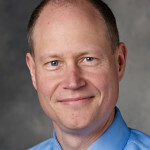 His research interests encompass several areas of stereotactic and functional neurosurgery, including frameless stereotactic approaches for therapy delivery to deep brain nuclei; mechanisms of action of deep brain stimulation; cortical physiology and its relationship to normal and pathological movement; neural prostheses; and the development of novel neuromodulatory techniques for the treatment of neurological diseases. During his residency in the early 1990’s, Dr. Henderson was intimately involved with the development of the new field of image-guided surgery. This innovative technology has revolutionized the practice of neurosurgery, allowing for safer and more effective operations with reduced operating time. Dr. Henderson remains one of the world’s foremost experts on the application of image-guided surgical techniques to functional neurosurgical procedures such as the placement of deep brain stimulators for movement disorders, epilepsy, pain, and psychiatric diseases. His work with NPTL focuses on the creation of clinically viable interfaces between the human brain and prosthetic devices to assist people with severe neurological disability.